David Lazarus » Do We Really Eat Christ's Flesh And Blood? One of the greatest disputes of Christian doctrinal belief is the true presence of the Flesh and Blood of Jesus Christ in the Bread and Wine of Communion or what is also known as the Eucharist or is this just a symbolic act, representing the Lord. First and foremost, we must examine the words of Jesus Himself as who can claim to know the Truth more than God Himself. In these verses, we read that Jesus specifically stated that the bread that He had Blessed “is” His “Body” as opposed to it is “like” or “represents” as some would have us believe. The same can be said for the “Blood”, our Lord again stated it “is” and these same words are repeated in both the gospels of Mark (Mark 14:22-25) and Luke (Luke 22:19-20). Yet we know that this cannot be true because when we look at the bread, we do not see flesh and when we look at the wine, we do not see blood. The same when we smell, taste or even touch these things we witness no change in them, they are what they seem, bread and wine. Thus, we know that Christ must have been talking symbolically as it is obvious that the Lord Himself cannot be wrong. Paul also speaks of these things, in the following verses the apostle talks “as to wise men”, exhorting us to have wisdom when we read his words. He writes of the “communion” of the “Blood” and of the “communion” of the “Body”, but he then refers to it as “bread”. So what wisdom is needed when all can see, smell, taste and touch what is clearly bread and wine? In verses 24 to 26, Paul repeats the message of Jesus, again with no symbolism but with absolutes by quoting the word “is” as did the Lord. However, in verse 27 we are given a clear warning, we are told not to eat of these things “unworthily” or we shall be guilty of the “body and blood of the Lord” again indicating that they are the true “body and blood”. Another question then is, what does it mean to eat “unworthily”? Verse 28 tells us we must each examine ourselves then in verse 29 we are told what it means to eat “unworthily”. This verse when read both alone and in the context of the surrounding verses clearly reveal that the wisdom of which Paul earlier spoke is discernment, specifically discernment for the Lord’s body and if we should eat of these “unworthily”, without this discernment we “eateth and drinketh damnation”. If we then have faith in these scriptures as truly being the inspired Word of God, then we are expected to believe, through nothing but discernment and our faith, that through some mystery of God, the bread and wine before us is in fact the Body and Blood of Christ. Of cause, not all believed this; the Gnostics, Ebionites and the Marcionites all rejected this as truth. However, these can hardly be regarded as reputable teachers of the Word. For example, the Marcionites, named after their founder Marcion, argued against the possibility based on their claim that Christ never truly resurrected and what appeared before Mary of Magdalene, the apostles and so on was merely a spiritual apparition, a phantom, and as such Jesus no longer had any flesh. Generally speaking, this was the accepted belief even after the schism of 451 AD, which divided the Church between Rome and those that stood against her corruption. Then in 1054 AD, the Church of Rome underwent another schism when what we today called the Eastern Orthodox Churches broke from her and even after this, the belief remained firm. Finally, in1379, John Wycliffe a member of the Roman clergy rejected the apostolic teaching that the bread and wine transforms into the Body and Blood of Christ upon consecration. He was followed by John Huss, then Martin Luther and many more as the Protestant movement was born. Now amongst the Protestants, this teaching is almost unanimously rejected. In every carnal sense, it would appear that those that deny the Bread is Christ’s Body and the wine is Christ’s blood are correct, yet through discernment and wisdom the apostle Paul states that the bread and wine are in fact Christ’s Body and Blood. Therefore, would it be fair to state men such as Wycliffe, Huss and Luther along with every Protestant has no wisdom or discernment granted to them by the Lord. Personally I find this unlikely as many have shown great wisdom, yet the scriptures do not lie so why the conflict between the Word of God and the early Church right through the ages up to today, and the Protestants who believe something different. There is however, one explanation that proves both can be correct, the scriptures state that Christ first blessed the bread and then called it His Body and the same with the wine, the Lord first blessed it as well. This was also part of the original faith, the apostles, to whom Christ had anointed with His authority would bless or as it is also called “consecrate” the bread and wine and only after the consecration were these elements ever regarded as the Body and Blood of Christ. The apostles then passed this authority on to others such as the Bishops, whom they ordained to oversee and shepherd the Churches they founded. These would then continue to consecrate the bread and wine and further anoint others as the Church grew, including more bishops as well as priests to act under their anointed authority and deacons to aid them just as the scriptures speak of deacons being ordained to aid the apostles. This would then explain the discrepancy. When Rome fell in 451 AD, she may well have lost her authority in Christ as was taught even by men from within their church such as Martin Luther, and in so doing could no longer consecrate the bread and wine, thus it would remain only bread and wine regardless of what they taught. Many years later some of their clergy, namely people like Wycliffe, Huss and Luther did not discern the Body and Blood of Christ and why, because it was still only bread and wine. Today nothing would be different; the original Churches that did not fall with Rome would still have their Bishops, priests and deacons to consecrate the Bread and wine so in those Churches the wise would discern the Body and Blood. However, in the Church of Rome, the wise would discern no change, resulting in them rejecting the teachings of their Church, as did the founders of the Protestants. 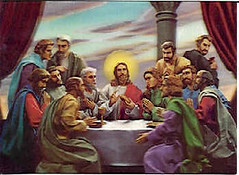 In this those that reject the bread and wine as being the Body and Blood are speaking truth for they have none with the authority to consecrate or “bless” as did Christ at His last supper. Yet those of the early Church and those of them that remained firm would also speak truth as they do have the authority to consecrate or “bless” as they would still carry the anointing passed from Christ to His apostles, from the apostles to the bishops then from the bishops to the new generations of bishops they in turn anointed. All that is then left is the Roman Catholics and the Eastern Orthodox Churches that still claim to hold this authority in Christ, but the Word says to judge by the fruits and what are those fruits, but division, false doctrines, treachery, murder, greed and a host of other factors that testify against them. We must then ask if the scriptures confirm that there shall remain such altars and if we look to the Book of Isaiah, we read of three that shall be acknowledged by the Lord on His Day of Judgment. What is of note is the these same three altars are they that stood against Rome in 451 AD, the Church of Alexandria in Egypt whom the Lord calls His “people”, the Church of Antioch in Assyria whom the Lord calls the “work of my hands” and the Church of Jerusalem in Israel whom the Lord calls His “inheritance”. Would it not then be a far statement to say that only in these Churches can any say with any scriptural support, the true Body and Blood of Christ is present on their altar? In addition, would it not also be far to say that those that deny the Body and Blood and discern these to be only bread and wine are also correct, as they have none to consecrate these elements that any spiritual change may occur?